Previous Versions are sometimes called ShadowCopies. This function must first be enabled on the file server on which your folders are kept. By default, ShadowCopies makes snapshots daily at 7:00 AM and Noon, but this can be altered. The number of copies that are available depends on how much space is dedicated for ShadowCopy storage. Restorations are done at the user’s desktop (or they can be done at any server using the \\UNC path). Option A: If the file still exists, but you want to restore an earlier version of it, right click on the file and choose Properties. Then click on the Previous Versions tab. You will see the copies available on the server from newest to oldest. (If it says “There are no previous versions available”, try option B). If you select the file, the following choice become available: Open and Restore. Choose Restore? Then the previous version will OVERWRITE the file of the same name in the existing location. Keep that most current version AND restore the previous version? Then choose OPEN, and you can select an alternate destination folder or file name. Option B: If the file was deleted and no longer exists (or if it says “There are no previous versions available”), you should either right click in the white space of the window (not on a file), or navigate up one level so that you are looking at the folder that used to contain the file you want to restore. Right click and choose properties. Click on the Previous Versions tab. 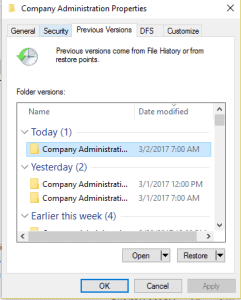 Click on the date that you want to restore from, and then click on the OPEN button. This will open that “Shadowcopied” folder and show you everything that was in it (the Address Bar will display the date that the snapshot was made). You may see the file you want to restore, if it existed at the time of that snapshot. If it does, right click and COPY the file. Then paste the file in the location of your choice. If you still don’t see the file you’re looking for, you will have to try an earlier date. Basically this is the same procedure as above, except keep in mind that by restoring a folder you overwrite the entire folder and everything in it. You may want to use the “Copy” option and choose a different location, instead of “Restore” which will overwrite. You can also choose the option to “Open” the folder in order to view its contents, or you can even launch the documents to read them without disturbing the originals.